It’s the moment when Mr. McGuire corrals young Ben Braddock at a party to have a word with him — one word holding a potentially great future. In the case of Williams, cast here as Braddock, it was a chat with a Maryland Farm Bureau official earlier this year. “I said, ‘Mr. Farm Bureau, what’s hot? What’s new in agriculture in the state of Maryland? 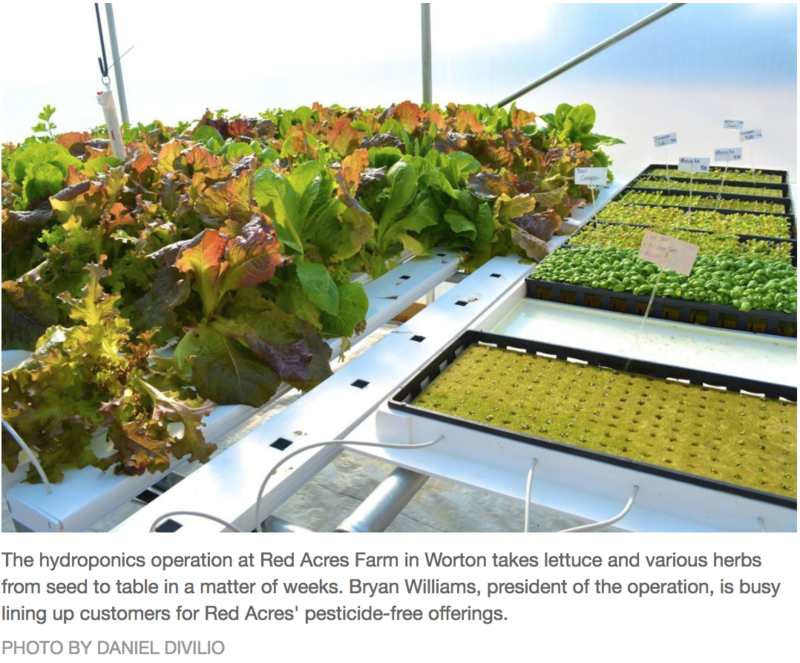 And he thought about it and he went, ‘Hydroponics,’” Williams said. 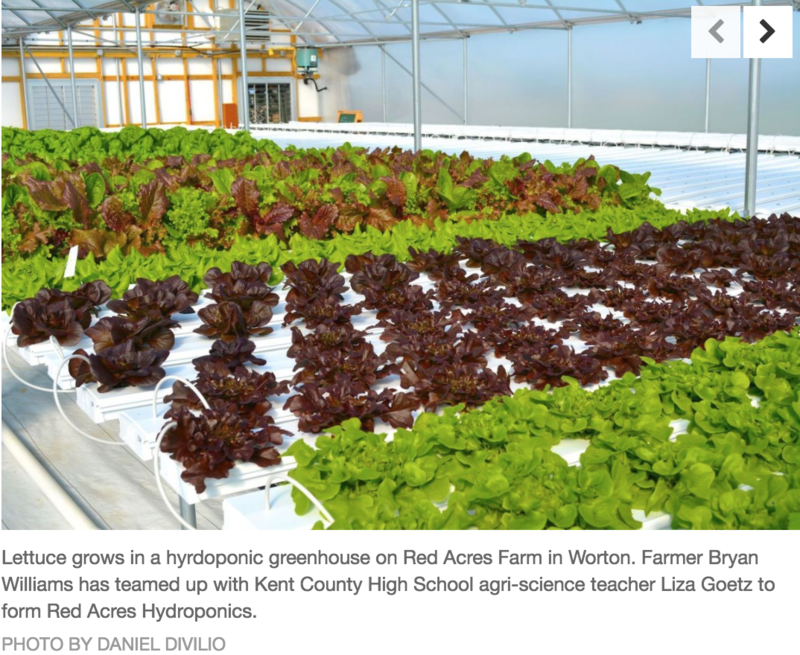 Now Red Acres Farm, the one next to Kent County High School in Worton with “Go Kent” painted in big block letters on the silo, features a greenhouse with hydroponic lettuce and herbs. 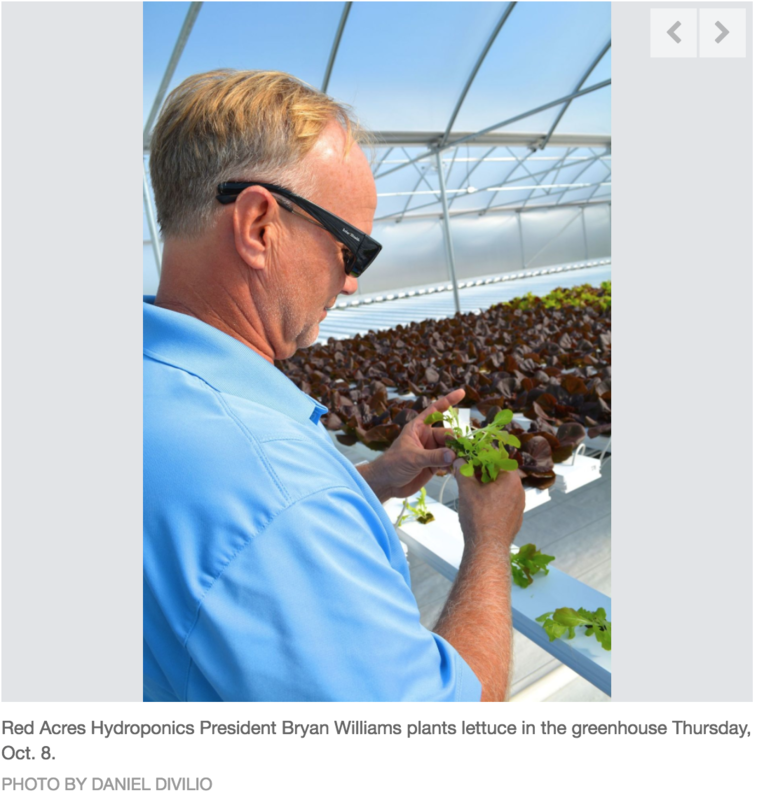 “We can grow every kind of lettuce except iceberg,” Williams said during a Thursday, Oct. 8 tour of the operation. The seed of the idea first took root a little earlier, after a visit to KCHS agri-science teacher Liza Goetz’ classroom during an open house at the school, where Williams’ wife happens to be the principal. Williams himself is vice president of the Kent County Board of Education. In Goetz’ classroom was a small hydroponic setup. 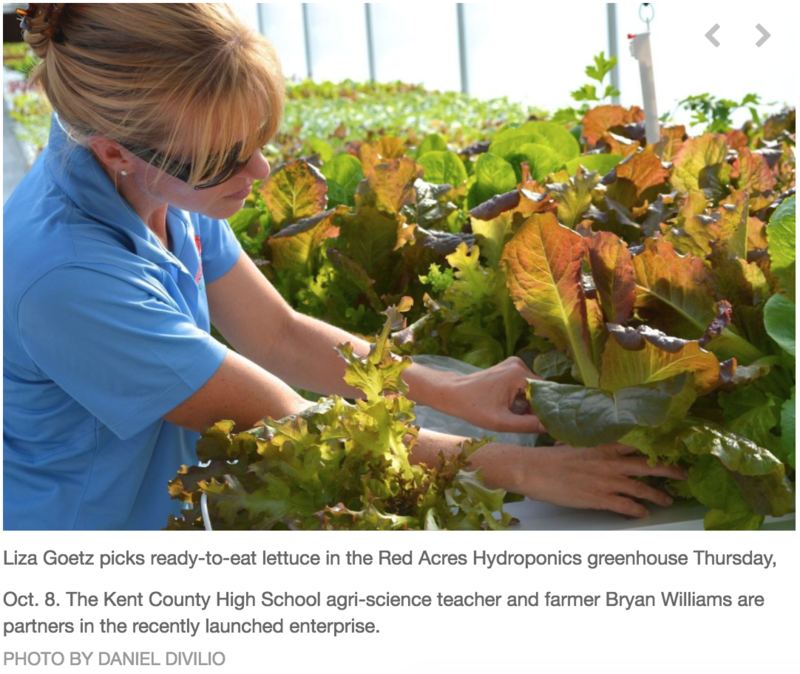 “She was growing lettuce at the high school, and I was like ‘What is this?’” Williams said. The chat later with “Mr. Farm Bureau” was kismet, and had Williams dialing Goetz to propose the business venture called Red Acres Hydroponics. Williams’ cousin, Billy Wessel, is the third key player in the operation. “He’s been a huge help,” Williams said. Red Acres Hydroponics may be young, but the orders are coming in. It’s a good thing the greenhouse has plenty of room for expansion. Williams said New Yarmouth Restaurant in Rock Hall has purchased greens from Red Acres. He said they also were invited to Harrington Raceway & Casino in Delaware to participate in a farm expo that could yield more restaurant orders. A lot of time, thought and research went into the operation. While the partners first started talking about it back in the beginning of the year, they did not break ground on the greenhouse until the summer. “We’ve been selling for about three weeks now,” Williams said. Goetz, whose undergraduate degree from Delaware Valley University is in fruit and vegetable production, spoke about the importance of freshness, quality and consistency hydroponics can provide. The seeds are first planted in rock wool trays — that is stone spun like cotton candy into a pervious, wool-like material, Goetz said. 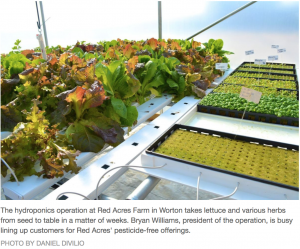 To ensure that Red Acres is providing only the best vegetables, not every plant from the nursery makes the cut for the growing channels — which pains Williams, an apparent adherent to “The Little Engine That Could” brand of philosophy, a bit. The growing channels are long white trays with holes cut for individual plants. While nutrient-rich water constantly circulates along the bottom of each tray, Goetz said the operation uses a lot fewer resources than conventional farming. “We use a lot less water and a lot less fertilizers because we can recycle everything that we need,” Goetz said. Computers do much of the greenhouse monitoring. All aspects of the operation are controlled, from pH and nutrient levels to the temperature. Carbon dioxide canisters were installed to ensure plants do not use up all the atmosphere they need to thrive in a closed environment. Red Acres also employs more lo-fi methods of keeping tabs on its crop, such as sticky cards staked among the vegetables in the growing channels. Goetz looks at what is sticking to the cards, be it pests or dirt, to check for any issues. Being a pesticide-free operation, Red Acres employs nature’s food chain to help eradicate any unwanted visitors. “Last week, we released ladybugs. Ladybugs are one of the best, most voracious predators to prevent anything from becoming an issue in the greenhouse,” Goetz said. With the greenhouse being such a controlled environment, visitors are asked not to touch the plants. Williams, who also is a conventional farmer, must take extra care to ensure nothing travels on him from the fields outside into the greenhouse. “So I have an extra set of clothes here,” Williams said. Red Acres is making its way through the U.S. Department of Agriculture’s organic certification process, but that takes time. Williams said that after restaurants ask about the USDA certification, they want to know if Red Acres is pesticide free. He said consumers are more concerned with reducing exposure to pesticide than seeing the USDA organic logo. “Locally produced” is another phrase customers also are becoming more interested in reading on signs, menus and labels. Goetz said greens break down during refrigeration, losing freshness. She said Red Acres’ offerings do not grow through the same cycle of repeated coolings as the greens from industrial producers. “They come from the field, they’re cooled. They’re shipped to the packing facility. Then they’re cooled again. Then they’re shipped. I mean, there are so many different times where it’s packaged and handled, and we don’t have this. We just don’t have it,” Goetz said. “One of the things that’s been nice to me, as the ag teacher next door, is being able to bring kids over, walk them through and show them real-time, real-life, there’s so much more to ag,” Goetz said. As hydroponics grow in popularity — Delaware Valley University happens to be building a new bio-technology and hydroponics space — Goetz said her students already have a leg up because they have seen such an operation here. Williams said they plan to offer internships. He said it can be tough to find such opportunities for the agriculture students. As for future customers, Williams said there will be a cooler installed at the farm in about a month so people can stop by and pick up some Red Acres produce for dinner. They also offer deliveries to household customers. Goetz is pushing for Red Acres to make its farmers market debut and Williams said more and more people are asking where to get their products. “It’s starting to catch on,” he said. For more information, visit redacreshydro.com.